1 tube of 100 units glow bracelets. These are a huge hit at any party. 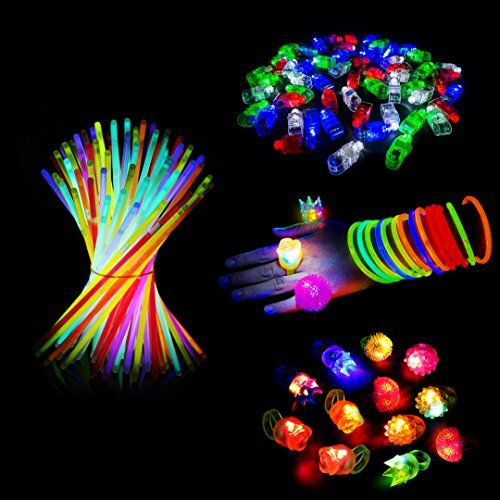 Whether you are using it as a bracelet or connecting them together to make necklaces or crowns, glow sticks are fun for all ages. Package includes high quality both glow sticks and connectors. Easy to use, there are two kinds of liquid in the plastic stick, when you bend the stick, the two liquid come together and glow, then you connect the two ends with the connector. 36 units Led finger lights, held by elastic band to fit fingers comfortably. They look dramatically beautiful when you wave them in the dark, providing up to hours of illumination to outlast any event or festivity. 12 units super Bright Flashing LED Bumpy Rings. The elastic rubber ring will fit any finger size, from toddlers to adults. There are 4 designs -crown, pompom, rose and strawberry. On the back of each ring is a small ON/OFF switch button that can be seen and felt through the rubber, this enables the lights to be turned on and off. Each flashing ring rapidly flashes three super bright LED colors. ❤️ALL INCLUSIVE PACKAGE GREAT PARTY MAKER Perfect for parties birthday, graduation, wedding, concert shows. Make the atmosphere so cool. Use your imagination and fantastic ideas to make all types of lights and bring happiness to everyone. ❤️PREMIUM QUALITY SUPER BRIGHT & LONG- LASTING ILLUMINATION New High quality products more durable and better assembled lasting hours of illumination. Awesome and Eye-catching. ❤️ADULTS AND KIDS WILL LOVE THEM One size fits all. Kids just love them. They are great party favorites for everyone. You can give them away to your children, grandchildren, nieces and nephews. ❤️EASY TO USE: Glow bracelet - bend the stick and it will glow. Led bumpy ring - on the back of each ring is a small ON/OFF switch button that can be seen and felt through the rubber, this enables the lights to be turned on and off. Led finger light - Held by elastic band so that you can attach to any fingers. The switch on the top of the finger light can be turned on and off. ❤️PACKAGE CONTENTS: GLOW BRACELET - 100 high quality glow sticks and connectors. You can use it as a bracelet or connecting them together to make necklaces or crowns. Colors: pink, green, blue, yellow, orange, red, white and purple. LED FINGER LIGHT - 36 Led finger lights red, blue, green and white. Held by elastic band and fit fingers comfortably. LED BUMPY RING - 12 Super Bright Flashing Rings with Batteries. 4 designs (crown, pompom, rose and strawberry), 5 Colors.